Yes, I am still harping on the $23K totem pole! Traditional dancers gathered at the base of Mount Roberts Monday for a ceremony sending off the “Census Totem Pole,” carved to tell the story of the 2010 Census. 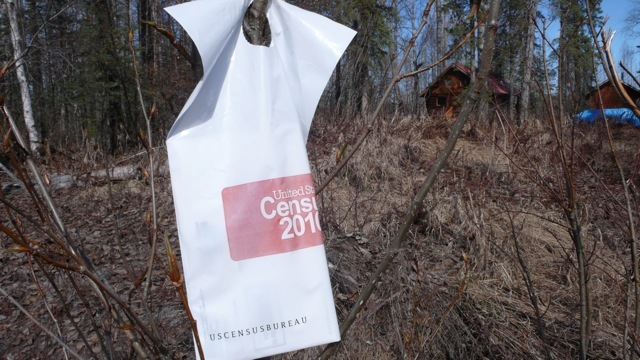 This year has marked an unprecedented effort by the U.S. Census Bureau to get a complete enumeration of some of Alaska’s most difficult to count populations, the widely scattered, predominately native villages throughout rural Alaska. That included commissioning a totem pole to tell the story of the census. Sitka carver Tommy Joseph called a census-themed totem “out of the ordinary,” but said its mission and symbolism was important. The totem itself contains representations of Raven and Eagle at either end to reflect the two Tlingit moeities that make up all the people. “Everybody needs to be counted,” Joseph said. Also on the totem are multiple hand prints, contributed by visitors to Joseph’s studio at the National Park Service’s Southeast Alaska Indian Cultural Center in Sitka. The Census 2010 logo of a hand, along with the motto “It’s in our hands,” are represented by the hand prints, Joseph said. Those contributing the prints included a schoolteacher, a janitor, a fisherman, a judge, a weaver and a young girl, he said, reflecting the challenge. “Everybody needs to be counted,” he said. The Census 2010 took a step towards closing down its counting operations Friday, with the shutting down of its toll-free telephone questionnaire assistance line. Now, the Census totem will be shipped to the U.S. Census Bureau’s headquarters near Washington, D.C. Early Monday morning, before the day’s four cruise ships had arrived, census officials, local dignitaries, dancers and honorary bearers showed up for the send-off. The census totem has already visited several other Alaska and Pacific Northwest communities to help the Census 2010 campaign. State Sen. Albert Kookesh, D-Angoon, and chairman of Sealaska Corp., said it was an appropriate way to mark the movement of the totem from Alaska to its permanent home at the Census Bureau’s headquarters. The totem is more than just the wood, in this case red cedar from Prince of Wales Island, from which it is made. “The totem and the culture are the same,” he said. The complete count is important to Alaska’s Native population, he said, because undercounting will result in less influence when it comes to representing rural and Native issues, he said. “We lose representation in the Senate if we don’t get a good count,” he said. Katherine Eldemar, who with Assemblyman Bob Doll chairs the city’s Complete Count Committee, praised the Census Bureau for the steps it took in 2010 to reach out to the communities it has had difficulty counting in the past. Sen. Dennis Egan, D-Juneau, said he hoped the efforts pioneered here this year will be used in future censuses. “I hope the Census Bureau in (2020) will bring the totem pole back to Alaska,” and make a similarly strong effort at a count, he said. Among those participating in the ceremony at the Mount Roberts Tramway, owned by Goldbelt Corp., was Goldbelt Chairman Randy Wanamaker, along with Ed Thomas of the Tlingit-Haida Central Council and Kake Tribal Corp.’s Harold Martin. As the honorary bearers carried the totem pole out of the building to begin its trip east, the Children of All Nations dance group sang. Then, having seen the totem pole off to its new home, and with the Golden Princess moving in to dock, the traditional dancers left and turned the waterfront over the day’s influx of tourists. Yesterday, I blogged about how the Census Bureau paid $20,000 to construct a 2010 Census totem pole that is now being shipped from Alaska to Washington DC for more than $3,000. 2. How much money has the Census Bureau spent on art projects? 3. How much money did it cost to make the totem pole video that is on YouTube that (before I blogged about it) received only 42 total views and still only has 217 views? 4. Who are Deni Luna/Gutacetla — the people who are responsible for this video? Is it the same person as on this web site? Was the bidding process to make this video competitive? Were the Tinglit Raven Clan compensated for their part in the video? If so, how much money? 5. Why would the Census Bureau commission Tommy Joseph, an artist from Sitka, Alaska, to design a totem pole to commemorate an action taken by people of Noorvik, Alaska — two places that are approximately 1,500 miles apart from each other? Since you have prejudged the value of this important promotional effort before knowing anything about the cost, I’m doubtful the following will be of much solace to you. In early 2010 while plans were being made for the first enumeration in Noorvik, Alaska, one of the oldest native organizations in the state made a significant gesture. The Alaska Native Brotherhood passed a resolution supporting the Census and forming the creation of a totem pole to mark this significant event. Our Seattle Region put together a plan to commission the art, and have it travel Alaska and Washington State tribal events for several months to promote participation in the 2010 Census. The totem pole is a storytelling icon steeped in the culture and traditions of the Alaska Native and Northwest Pacific Coastal peoples. It is an immediately recognizable symbol to the native people throughout America’s largest state. The art was commissioned at a cost of $20,000. The cost to have it travel across the country for permanent display at Census is $3,111. We believe strongly that this has been a very effective promotional investment that symbolizes the Census Bureau’s constitutional mandate to ensure a complete count of all tribal lands, especially the 564 Federally recognized tribes. The response to the Census Totem encouraged us to find a permanent home for it here at our headquarters along with other historical Census artifacts. I would venture a guess that the total cost for the Totem project is less than the cost burden the Census Bureau has incurred to complete the search of your list of 26 explicit profanities that might have been found in any emails regarding the 2010 Census of 10 senior staff at the Census Bureau over several years. I understand we have found just two emails responsive to your request which refer to news accounts which happened to have one of the words on your list. Mr. Jost took over until the present. the government), I am requesting that all fees be waived. handling this request, you may telephone me at any time at XXXXXXXXX. Our Office will continue processing your request with all practical speed. Sending a 2010 Census totem pole from Alaska to Washington – On your dime! JUNEAU – For the first time in history, the 2010 Census commissioned Sitka carver Tommy Joseph to design and carve a totem pole specifically for the Census. Since its completion this spring, the totem pole has traveled throughout many communities in Southeast Alaska during the census data collection process. The totem is currently on display at Goldbelt’s Mt. Roberts Tramway in Juneau. A celebration and dedication will be held as the totem begins its journey to its new home at the Census Bureau’s headquarters near Washington, D.C. All are invited to attend the celebration beginning at 9:30 a.m. on Monday, Aug. 2 at the Mount Roberts Tramway. Meet the artist, enjoy traditional songs and dances performed by the Children of All Nations, and join the event with other special guests. This news comes from Alaska. Much has been made lately of Alaska’s lackluster rate of participation in the 2010 census. But it turns out there’s at least one demographic that’s significantly worse than Alaskans: Hipsters. In the capital city of hipsterdom, the Williamsburg neighborhood of Brooklyn, N.Y., census participation is right around 30 percent — more than 20 percent below Alaska’s current statewide rate — according to a recent NPR report. The reason? Um, like, whatever. Meanwhile, my fellow Alaskans, I think we’re missing an important opportunity to polish up our image. Outsiders might look at our bottom-of-the-barrel census participation rate and chalk it up to our being backwoods rednecks who can’t dig out of our mountainside snowdrifts in time to brave polar bear attacks and coastal erosion as we hike to the post office to get our census forms in the mail, or to our resentment of gummint intrusion into our gun-toting, aerial-wolf-hunting, pot-decriminalizing libertarian lifestyles. All of which just contributes to the perpetuation of the image of Alaska as a frozen wilderness outpost where people talk with Minnesota accents and only pick up a newspaper to swat away Russian spy planes rearing their heads into our airspace. It’s time to take a clue from our retro-glasses-and-ironic-T-shirt-wearing brethren in the ‘burg. Clearly the hipsters are on to something here: We just need to come up with a really existential-sounding reason for the state’s low return rate. Like, what’s the point? We’re not too remote to participate in the census; we’re just too cool. And if you think it’s ridiculous to imply that Alaskans have anything to learn from hipsters, keep in mind that hipsters have been taking style clues from Alaskans for years. We’ve always known that plaid shirts, bedhead and dive bars are cool; it just took them a while to catch on. SEMINOLE COUNTY – It’s 10 simple questions with a decade of implications. Every 10 years, as per the Constitution, the United States performs a census – a headcount and snapshot of everyone living in the U.S. The original intent was to make sure that each state got its fair portion of people in the House of Representatives. But that was more than 200 years ago. What does the census mean these days? The answer may surprise you, as the 2010 census could drastically change the future of politics in Florida – and in Seminole County. This is the first of two articles which will examine how a questionnaire could change the political landscape for the next 10 years, and maybe beyond. And it all started with a Massachusetts governor in 1812. Chances are, you’ve never heard of Massachusetts Governor Elbridge Gerry. But you’ve probably heard of the term gerrymandering. Gerry was governor during the 1812 election and was responsible for drawing the voting districts. Gerry drew one district that slithered across the state, in the shape of salamander. Gilbert Stuart drew a cartoon for the Columbian Centinel’s March 26 issue, and editor Benjamin Russel first coined the term gerrymandering to describe the district. The name stuck, and now when a district is drawn to keep someone elected, or to keep minorities from gaining representation, that’s what it’s called. And in Florida, there are some strangely shaped districts. In South Florida, Florida Senate District 27 touches the Atlantic Ocean and the Gulf of Mexico through more than 140 miles of Florida. The seat, held by State Senator Dave Aronberg, touches parts of Palm Beach County, Hendry County, Glades County, Charlotte County and Lee County. Take a look at Florida House District 29: It starts just off the east coast of Florida in Fellsmere and west Vero in Indian River County, snakes west of Palm Bay into Brevard County, and then reaches up like a finger through Cocoa, Port St. John and Titusville. In one area, it’s surrounded on three sides like a peninsula by House District 32. Freidin has been working for nearly the last four years to get enough signatures together to propose two constitutional amendments. This November, Floridians will be asked to vote up or down on Amendments 5 and 6. Both would make it a constitutional requirement that the Florida House, Florida Senate and U.S. House of Representative districts be drawn along existing city, county and water bodies, when possible. The heart of the issue, Freidin said, is making elections more fair. Florida has some of the least competitive elections in the country. In the last decade, only 10 members of the Florida House of Representatives and one Florida senator have been defeated as an incumbent running for re-election. Republican Ralph Poppell has represented District 29 since the 2002 elections, the first election after the district was redrawn. Aronberg has also represented District 27 since 2002. When the 2010 census is finished, all those Florida districts – all those salamanders – will be redrawn by the Florida Legislature. That’s a once-in-a-decade opportunity that Fair Districts Florida didn’t want to miss. Mike Ertel, the Seminole County Supervisor of Elections, said that the salamander districts have been an issue forever. SPRINGFIELD, Ill. (AP) – Illinois Senate Democrats want to take the luck of the draw out of legislative and congressional district lines drawn every 10 years. They proposed a plan Thursday that would allow a “special master” appointed by two Supreme Court justices of different political parties to draw a map in case of gridlock. The three maps since the 1970 Constitution have been drafted by the political party whose name was drawn from a hat. The 2010 Census will show population shifts that require new district lines. Chicago Democratic Sen. Kwame Raoul (KWAH’-may RAW’-ool) says his committee’s plan would allow the Legislature first crack at map-drawing. A Republican plan says sitting lawmakers should not be involved at all. Voters have to approve any proposal to change the Constitution this fall. JUNEAU, Alaska (AP) – The measure calling for a ballot question and constitutional amendment to add 12 seats to Alaska’s 60-seat Legislature appears to be making headway. The Senate Judiciary Committee passed its version of the measure Wednesday, while the House version gained eight cosponsors from both parties in the last two weeks. The expansion is intended to ease redistricting after the 2010 Census count is in. Through redistricting, rural districts are expected to grow geographically while urban districts shrink to maintain roughly equal population representation. Over the years, the trend has made rural districts harder to manage. Sen. Albert Kookesh’s is the most egregious example, covering about half the state’s land area across nearly 1,000 miles. Dr. Robert Groves vs. PETA…a battle looming? Monday evening we had a feast of moose, caribou, and muktuk (whale skin and blubber) along with more traditional fare like turkey and dressing. The meal was followed with native dancing from villages surrounding Noorvik (some as far North as New Hope on the Northern coast). Next a band of electric and acoustic guitars, drums, and keyboard appeared, playing mainly country and western music. The musicians were the mayor, the president of the Noorvik native community, and the school principal among others. They started with an old Hank Williams tune, and played other favorites they had grown up with. Census Bureau director Robert M. Groves will travel to Alaska Monday to begin the official tally for the 2010 Census. Groves is slated to count the first household in Noorvik, a remote Inupiat Eskimo village located north of Arctic Circle. Monday’s single count will be the only one conducted by Groves, and the rest of Noorvik’s population will be enumerated beginning Tuesday. Census workers and trained locals are expected to take a week to interview villagers from the same 10-question forms to be mailed to most residents March 15. Census workers also will visit 217 other rural communities, all in Alaska, in the coming weeks. Alaskans in rural communities not linked by roads have been the first people counted since the 1990 census. The unlinked communities are the places where the process is first conducted in person by census workers. The bureau makes personal visits to nonresponding residents around the country. It’s easier to get census workers to the Alaska villages before the spring thaw brings a muddy mess, making access more difficult, said Ralph Lee, director of the bureau’s Seattle region, which oversees Alaska. Also, residents in many villages still live off the land, hunting and fishing for their food, and it’s important to reach them before they set off for fishing camps or hunting expeditions when the weather begins to warm. Which states need to improve their Census response rates? Census forms won’t reach homes until March, but the Census Bureau is already publicizing a three-stage advertising campaign aimed, in part, at encouraging people to fill out their forms and cooperate with Census workers. So, in which states should the Census Bureau concentrate its efforts? A look at the response rates from the 2000 and 1990 censuses show that, in general, the same states had low numbers in both years. Alaska had the lowest response rate in both 2000 (56 percent) and 1999 (52 percent). South Carolina had the next-worse response rate in both years, with 58 percent in 2000 and 56 percent in 1990. (Puerto Rico, a U.S. territory, had a response rate of just 53-percent in 2000). At the other end, Iowa had the best response rate in 2000 with 76 percent, followed by Minnesota, Nebraska and Wisconsin at 75 percent. In 1990, Wisconsin topped the list with a 77-percent response rate. Iowa and Minnesota tied for second-best at 76 percent. The national response rate was 67 percent in 2000 and 65 in 1990. The Census Bureau is predicting a drop in the response rate, to 64 percent, for the 2010 Census. More areas with low response rates include Washington, D.C. (60 percent in 2000, 56 percent in 1990), Louisiana (60 percent in 2000, 58 percent in 1990), Hawaii (60 percent in 2000, 62 percent in 1990), Vermont (60 percent in 2000, 64 percent in 1990) and Maine (61 percent in 2000, 58 percent in 1990). Other states with high response rates were South Dakota (74 percent in both years), Virginia (72 percent in 2000, 70 percent in 1990), North Dakota (72 percent both years) and Ohio (72 percent in 2000, 75 percent in 1990). This county-by-county map shows a more detailed breakdown of response rates from the 2000 Census. Some states are already striving to improve their performance from the last count. The Herald in Rock Hill, S.C., reported that the state will have heavier marketing and outreach efforts in the 10 or 12 counties that had the lowest response rates in 2000. “Some people just don’t understand the importance of the census,” Michael Sponhour, spokesman for the State Budget and Control Board, told the paper. There were some technical glitches during a media conference call last week with Census Bureau director Robert M. Groves about the status of the 2010 Census. Stephen got dropped off the call, and we wrote an editorial criticizing the Bureau’s technical problems with the conference call and failure to make a transcript available. This afternoon, Stacy Gimbel of the Census Bureau responded in the comments to the editorial with this link to the transcript of the briefing (as a pdf). In response to a question on the economy, Groves said the recession has led to a larger applicant pool for Census workers, but the vacancy rate (due to foreclosures) means forms will be sent to addresses where no one lives. According to Groves, self-identification questions (such as about ethnicity) change on almost every Census form. The Bureau wants people to write-in how they identify themselves if none of the provided options apply. And some upcoming key dates: Census road tour begins Jan. 4, media kickoff event in Washington, D.C., on Jan. 14, paid media ads start airing Jan. 18, Groves travels to Alaska for the first enumeration of a remote village on Jan. 25. 911 CALL: Officers believe woman tried to get help before dying. An Alaska State Trooper shot and killed a naked, knife-wielding man at a Fairbanks home Tuesday morning after he confronted officers and refused to put down the weapon, according to troopers. Investigators later found the body of his mother inside the home lying next to a phone. Troopers say the man, Thom Depace Wylie Gruenig, 38, was declared dead at Fairbanks Memorial Hospital shortly after the shooting. Found in the home was his mother, Kathryn L. Gruenig, 66, whose death was being investigated as a homicide, troopers said. Troopers were summoned to the home off University Avenue and College Road about 7:40 a.m. after getting a 911 call during which dispatchers heard labored breathing but got no answer, according to troopers spokeswoman Megan Peters. A lone trooper, who was not immediately named, knocked on the door with medics standing by. Christine Lundberg, 58, lives across the street from the home on Hess Avenue. She said she had just taken her granddaughter to school and returned home when she saw a police car. Lundberg said the woman and her son live in the brown home but that she didn’t know them well. Sometimes she would say hi when she saw Thom walking to the University of Alaska Fairbanks or his mother going to her car, she said. Neighbor Dover Williams, 59, said the home has always been quiet, and the people living there kept to themselves. “They have real tall fences around their lot and they’ve got a lot of the Siberian pea that’s grown quite tall, so you never really saw them that much at all,” Williams said. City property records indicate the home belongs to Kathryn Gruenig, assistant to the director at UAF’s Institute of Northern Engineering. Thom Gruenig was currently working as a field operations supervisor for the 2010 Census, according to a resume posted on his personal Web site. He has previously worked for the University of Alaska, his resume says. As medics began trying to save Thom Gruenig, the trooper went inside to find out why 911 was called and found his mother, Holloway said. Troopers’ “working theory” is that she called 911 as she was dying, he said., though he wouldn’t say how the woman died. Asked if she was stabbed to death, he said, “Not exactly.” Also unclear was why Thom was naked. Investigators found a marijuana growing operation in the lower level of the home involving about 30-40 plants. Holloway said investigators didn’t yet know if the drugs played a role in the situation. About 640 people live in Noorvik. Give or take. Want the exact head count? Check back next year when the Inupiat Eskimo village is expected to become the first town in America to be counted in the 2010 census. U.S. Census Bureau officials let news of Noorvik’s preliminary selection spill during a presentation Thursday in Anchorage as the bureau prepares for months of counting households in Alaska’s remote towns and villages. The census, conducted nationwide every 10 years, isn’t just about counting people. It represents money, with the results used to determine how much Alaska gets in federal funding for Medicaid and other programs. The numbers can even cost politicians their jobs, as the state redraws voting districts after each census. Anchorage and the Mat-Su could pick up a seat in the Legislature, for example, while Southeast Alaska stands to lose one because of population declines, said state demographer Greg Williams. The 2000 census counted 626,900 people in Alaska, Williams said. The state estimates the population has grown by about 8.4 percent, to 679,700, as of 2008. The latest count comes as researchers puzzle over an apparent migration from Alaska’s villages to larger towns and cities. The Aleutian Region School District, for example, plans to close a school in Nikolski in the fall because of low enrollment, according to the state Education Department. “You can go all the way down the Alaska Peninsula and out to the Aleutian Islands, and all the districts have been declining,” said Superintendent Joe Beckford. A recent report by the state Division of Community and Regional Affairs said the population in rural Alaska dropped by 3.6 percent between 2000 and 2008. High fuel prices last year sparked talk of a rural exodus, but a May 2008 study by the Institute of Social and Economic Research at the University of Alaska Anchorage said the trend can’t be blamed on energy costs alone. “What makes this census particularly timely and anticipated is that there’s competing conventional wisdoms and a lot of discussion going on about what is really happening,” said Steve Colt, associate professor with the institute.